The man, convicted of stealing, government property, could spend the rest of his life in prison. Nguyen Van Chinh hadn't felt the clasp of handcuffs for 24 years. After being convicted of stealing government property, Chinh, 54, spent a year in a prison before breaking free and starting a new life in the Central Highlands. This month, however, the law finally caught up to him. 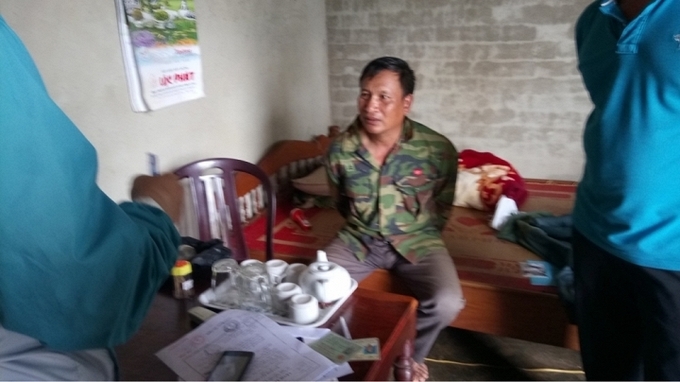 Police in Dak Lak Province say Chinh changed his name and appearance and developed a “perfect cover" as a well-mannered family man. In 1992, a court in Chinh's home northern province of Tuyen Quang sentenced him to eight years, only one of which he served. After escaping with another inmate, Chinh snuck home to say goodbye to his wife and son before jumping on a bus to Dak Lak. There, he began picking coffee as a hired hand. When the harvest ended, he took construction jobs and cut all contact with people back home. Chinh eventually married a local woman and had a baby. Police say the couple settled on the outskirts of the provincial capital, Buon Ma Thuot, where neighboring farmers chose Chinh to represent their rural commune. Before long, the fugitive had a new ID card, a different name, a different birthday, a different hometown. Media accounts have not revealed the details of his crime, but the police never forgot him. In 1995, after his second wife died following the birth of their second child, Chinh sent both babies home to live with his grandparents in Tuyen Quang. The sudden appearance of the children in the rural northern province would ultimately lead investigators to their father. “We had been searching and there was no construction worker named Chinh in the area,” said Major Nguyen Van Duong from the provincial fugitive recovery unit. He said they have almost dropped their search, given a lack of leads. But with some special police tricks that Duong refused to explain, they decided that Chinh, then living under the name Chien, was their man. “When we stepped into his house, he calmly told us we had the wrong guy,” the officer said. "Then he tried to flee." Chinh has been returned to Tuyen Quang, where he could face between three years and life in prison for having escaped.